This is the prototype of American Aircraft Modeler's "AAM Glowdriver." 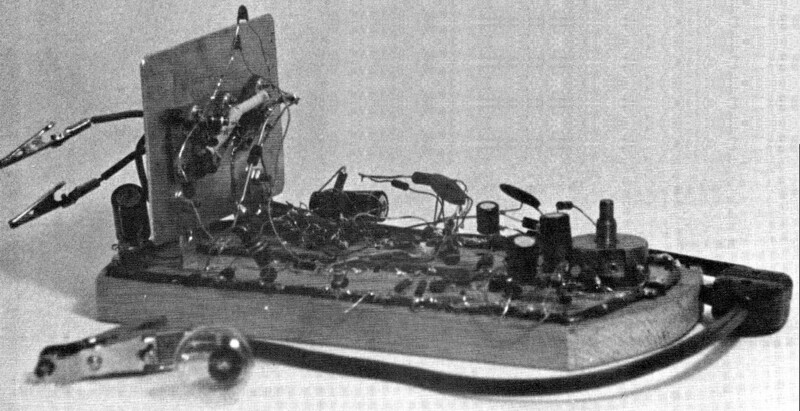 To be more accurate, the experimental construction is on an actual wooden breadboard - the kind used in a kitchen- making it in fact a prime example how the term "breadboard" for electronic circuit construction came to be. 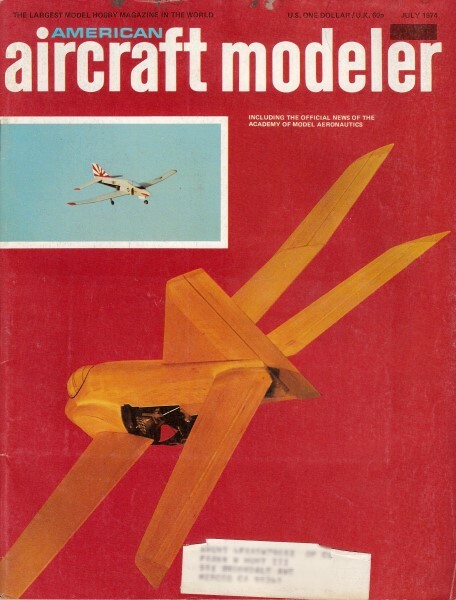 There is also an accompanying article in the same July 1974 edition titled "Fast Start Set Uses the AAM Glowdriver." Thanks to Danny M., a website visitor from The Land Down Under, who wrote to ask that I scan and post this article for what today we would call a 'smart' glow plug driver." Here's a gadget that takes the sense of accomplishment out of starting your engine. The prototype AAM Glowdriver. When the author said that he had one roughed out on a breadboard, he wasn't kidding - it's on an honest-to-goodness board for cutting bread! The accompanying article by Hobie Steele tells how to build a neat, compact version. Starting a model engine is a test of skill. The biggest problem is drowning the glow plug with fuel. A flooded plug gives no ignition. Afraid of the resulting silence, one tends to under-prime, and get silence anyway. The AAM Glowdriver clears a drowned plug in a fraction of a second. With ignition guaranteed, a big shot of fuel may be applied through the exhaust port - no more fear of over-priming. All engines tested so far have started with a few flips of the propeller - even in freezing weather. The AAM Glowdriver ends the minor worries, too. It will heat the plug all day long (a month or more of steady flying) on a single charge of its 12 volt motorcycle battery. It tells if the glow plug is burned out, and it warns, hours in advance, that the battery is weakening. There is no battery drain when the unit is not connected to the plug. Except in one important way (see below), the Glowdriver is used just like a clever battery. It heats the glow plug with current pulses of variable length (about 13 milliseconds apart). During each pulse, the potential across the plug and leads is about eight volts. The current through the plug is ten amperes, more or less, depending on the resistance of the plug. As the Glowdriver heats the plug, it simultaneously measures its temperature. It then automatically adjusts the length of the current pulses, to bring the temperature to the right value for guaranteed ignition. The prototype AAM Glowdriver. When the author said that he had one roughed out on a breadboard, he wasn't kidding - it's an honest-to-goodness board for cutting bread! The accompanying article by Hobie Steele tells how to build a neat, compact version. When the plug is fuel-soaked, the current pulses are up to six milliseconds long. The fuel near the hot element boils so violently that the excess fuel is immediately expelled. As the plug warms up to its normal temperature, the length of the current pulses drops to about .2-.5 milliseconds, depending on the type of plug. The heating current is switched on and off by the power transistors X5 and X6, under control of their driver (X4). This, and the string of emitter followers, X1, X2 and X3, form one half of a multivibrator, which times the current pulses. The other half of the multivibrator is X7. The resistance of the glow plug rises as its temperature increases. To measure its temperature, we measure the resistance with a Wheatstone bridge (the circuit to the left of X8 and X10 in the drawing). Bridge unbalance changes the potential between the base and the emitter of X8. If the glow plug is too hot, the current through X8 is larger than it ought to be. This current is amplified by X9. The amplified current speeds the discharge of the .47 microfarad C2. In this state, X7 is cut off, which shortens each pulse of heating current, and returns the glow plug to the right temperature. The temperature is set by the 500 ohm potentiometer. The current to run all parts of the circuit comes through the glow plug, and stops entirely when the plug is disconnected. Except during the heating current pulses, the circuit draws less than 50 milliamperes, which causes negligible potential drop across the plug. During the pulses of heating current, when the potential drop across the plug and leads is eight volts, the diodes D1 and D2 (above the bridge) cut off. The circuit then coasts on the charge stored in the two 1000 microfarad capacitors, C1 and C7. X10 and X11, and their associated components, cut off the current if the plug lead is shortened. They keep the plug from being overheated by multiple illegitimate pulses at the moment the connection is made and broken. The mini-lamp is a pilot light. It goes on whenever current flows through the glow plug lead. The light emitting diode tells the state of charge in the battery. Its brightness falls sharply as the battery discharges, and it goes out when only a couple of hours of operation remain. When both lights are out, either the battery is truly dead, or the glow plug is burned out or badly connected. To identify the trouble, one can short circuit the glow plug connector. The incandescent bulb will come on if the battery is live. Glowdriver will work without this luxury feature, since a faint buzzing noise tells when it is supplying current. Because different glow plugs have diverse resistances at operating temperature, they may require different temperature settings, even though their operating voltage may be the same. Here the AAM Glowdriver is not like a battery! With an unfamiliar glow plug, start with the temperature control at its coldest (the plug out of the engine). Connect the plug, and raise the temperature control until the plug has the right color. I find that Cox 010, 020 and 049 coiled wire plugs can all be run at the same setting, but may burn out on the setting that runs a Fox Standard plug. The component values in the bridge were chosen to cover all the glow plugs I could find, from the lowest resistance to the highest. To extend its range in the cooler direction, lower the value of R2; in the hotter direction, lower R4. To start an engine using the Glowdriver, set the needle valve according to the manufacturer's instructions. Prime the engine generously, preferably through the exhaust port, and flip the propeller until it starts. Remember the part about the needle valve. Do not make sure that you have enough fuel in the cylinder by opening the needle valve way up. Neither Glowdriver, nor anything else, can burn a never-ending stream of fuel. Because Glowdriver prevents plug drowning, one may still get occasional firing, and not realize that the mixture is too rich. If you do not know the right needle valve setting, start with it lean and prime heavily. The mixture must pass through the right value in its progress from too lean to rich. With the AAM Glowdriver keeping the plug dry, the engine will run at least briefly, and you can open the needle valve a bit and try again. Even inverted engines start easily with the AAM Glowdriver. After flooding my inverted OS Max 10 RC intentionally, I found that it will start in less than fifteen flips. Sometimes, one flip is enough. If you must start your engine in one second, rather than five, you can use an electric starter along with Glowdriver. The OS Max 10 RC and a Webra 60 both roar to life the instant the starter hits the spinner. Electric starters pull down the battery voltage, and some of them make it very uneven. The glow plug will probably heat up or cool down a bit while the starter is running, but not enough to cause trouble. If the plug gets very hot and threatens to burn out, X7 probably has much less than its proper current gain, and should be replaced. Glowdriver is great for the hydro modeler. A drowned engine can be running in less than a minute, without removing the glow plug. First, refuel under pressure so as to flush any water in the tank and fuel line out through the needle valve. When the fuel that drips out of the needle valve is clear, this purging is complete. Prime generously through the carburetor, to dilute the water in the crankcase. The engine will give isolated explosions almost immediately. After a couple of dozen revs, it will either start, or run for a burst and then stop. In the latter case, priming again through the carburetor will do the trick. Each of my Glowdrivers has also had at least one wiring error. All required some troubleshooting before they ran properly. Except for the high power transistors X4, X5 and X6, the use of hobby grade components has resulted in some defective items. The wires, shown as bold lines in the drawing, carry the pulses of heating current. Make them no thinner than No. 18 wire, so as not to have unwanted potential differences between one part of the circuit and another. For connecting Glowdriver to the battery and to the glow plug, household lamp cord is satisfactory (not more than 8 feet). If you want to run Glowdriver with 50 foot leads from your car battery, use heavier wire. Here, an oscilloscope is a great help. On one Glowdriver, I got rid of the bugs with only a voltmeter, to show that it could be done. The numbers in ovals in Figure 1 are voltages at the various points, relative to the negative buss. Readings are taken with the filament of a Fox Standard glow plug, or an 1133 light bulb, bright orange. Because troubleshooting can be expensive in glow plugs, I use a number 1133 six volt bulb as a dummy plug. It draws about the same current. If the test bulb fails to light, even when the temperature control is wound to maximum heat, put it to your ear and listen. If it is going "ping-ping-ping," the anti-short circuit is firing and keeping the current shut off. This can happen if you start with the temperature control set high. The resistance of the cold bulb is so low, compared to what Glowdriver expects, that it thinks the bulb is a short circuit. Turn the temperature control down to the bottom and bring it back up. If the bulb lights, the multivibrator is working and all is well. You can confirm this by listening to the bulb. It will be singing continuously from the multivibrator pulses. If, instead, the bulb continues to go "ping-ping-ping," you are on your own. This has never happened to me. If it did, I would check the wiring of the bridge, because X10 must be getting the wrong input. If the bulb fails to light and makes no noise at all, check that the electricity is actually reaching the timing circuit and the transistors X4, X5, and X6. There should be about twelve volts across each. If the circuit is correctly wired, the pilot light should light. If there are no volts, disconnect Glowdriver from the battery, and use an ohmmeter to locate the break in the circuit. To check the forward conduction of D1, or any other diode, the ohmmeter must be applied the right way round. In both of my ohmmeters the positive terminal on ohms only is black. To check yours, set it to ohms and charge a large capacitor with it. 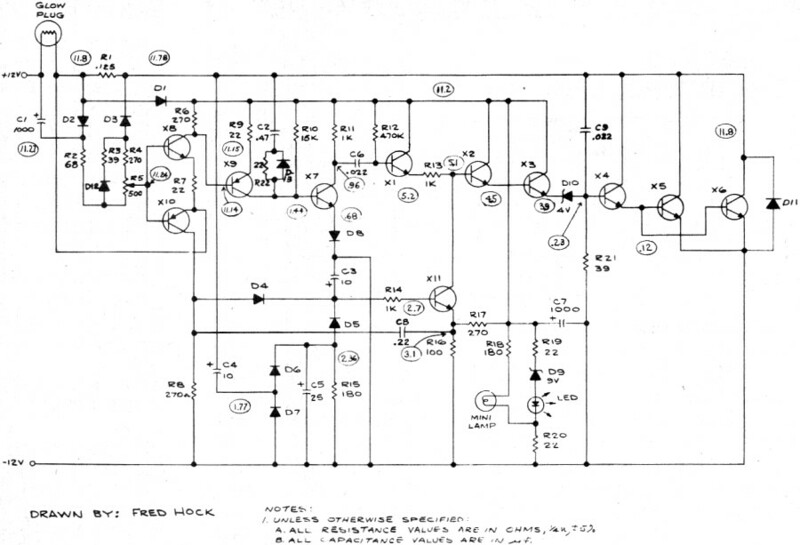 Then put it on the five to ten volt scale and connect it again to the capacitor. The direction of the kick tells the sign of the charge on the capacitor. AAM's Editor gives McCutchen's original AAM Glowdriver (a genuine Joule box) a try on an inverted, cowled engine. It started consistently (about a dozen times) on the first flip. If the circuit has volts on it, and the bulb still will not light, check the potentials between base and emitter of transistors X2, X3, X4, and the pair X5 and X6. If any base-emitter potential is much bigger than .6 volts, replace the transistor. Likewise, the Zener should have four volts across it, and the 1K resistor less than one volt. If the resistor has much more than this, disconnect X11 from X2, or remove X11. If the bulb now lights, the trouble is with X11 or the circuit that runs it. See if the potentials in the circuit match those in the diagram. If they do, X11 is shorted and should be replaced. If they are wrong, find out why. The circuit is simple enough, so it is not hard to run down the faulty component. If the light lights like a photoflood, X7 is probably dead or miswired. If the wiring is right, yet the collector potential is about 12 volts, replace X7 and all should be well. If the light sings, but lights brightly and cannot be turned down by the temperature control, there is trouble with the bridge, with X8 or with X9. Voltage measurements do not help much here, so check the wiring, and if you do not find the cause there, replace the transistors. If the bulb flares up briefly as it is connected and disconnected, the anti-multipulse circuit is not working. Check the potentials on X11. If they are wrong, find the bad component in the diode pump (C4, D6 and D7). If, when the glow plug connector is short circuited, it makes a heavy buzz, rather than a slow "tick-tick-tick," verify that the anti-multipulse feedback is working. If it is, then X11 is good, so the trouble must be in X10, or diode D4, or (less likely) capacitor C8. If these procedures do not find the trouble, something mysterious is happening, and you need a friend with an oscilloscope. The surest procedure is then to lift the collector of X11 from the base of X2 and connect it to the positive buss, via a 1K resistor. Also, lift the collector of X9 from the base of X7 and connect it to the negative buss, via a 39 ohm resistor. This isolates the temperature control feedback, the anti-multipulse and anti-short circuit feedbacks from the multivibrator. We can now examine the feedback signals. A further trick is to insert a 3.3 ohm resistor between the collector of X3 and the positive buss. The signal across this resistor should start at about 1.5 volts, implying .5 ampere of the drive current through the Zener to X4. This will fall with time, as the current pulse proceeds. If you are an experimenter at heart, build Glowdriver on a breadboard. It takes an evening, if you are not fussy about appearance. 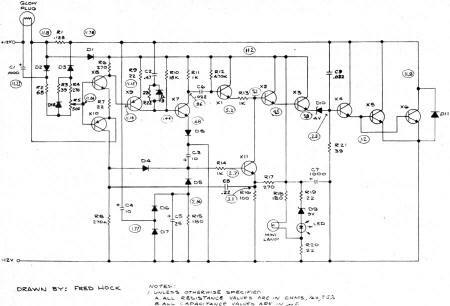 For a rugged, professional looking job, read the next article, where Hobie Steele tells how to make it as a printed circuit.